SANTA CRUZ, California — Hidden at the Santa Cruz Beach Boardwalk Amusement Park’s arcade is the “Classic Corner,” where vintage games such as Pac-Man, Frogger and Donkey Kong reside. When center Damian Jones of the G League’s Santa Cruz Warriors wants to get his mind off not playing with the Golden State Warriors or simply enjoy time off, the 7-footer can often be found improving his high score on the classic spaceship shooting game Galaga that debuted nearly 14 years before he was born. Santa Cruz natives rarely recognize him as a basketball player, so Jones usually can blow up enemy aliens without any bother. “Usually, I’m in the arcade. I’ve been mini-golfing once. I haven’t been on any of the rides yet. So, mostly, I’m in the arcade,” the 22-year-old Jones said. “The rides seem pretty old. There is probably not enough space for me. 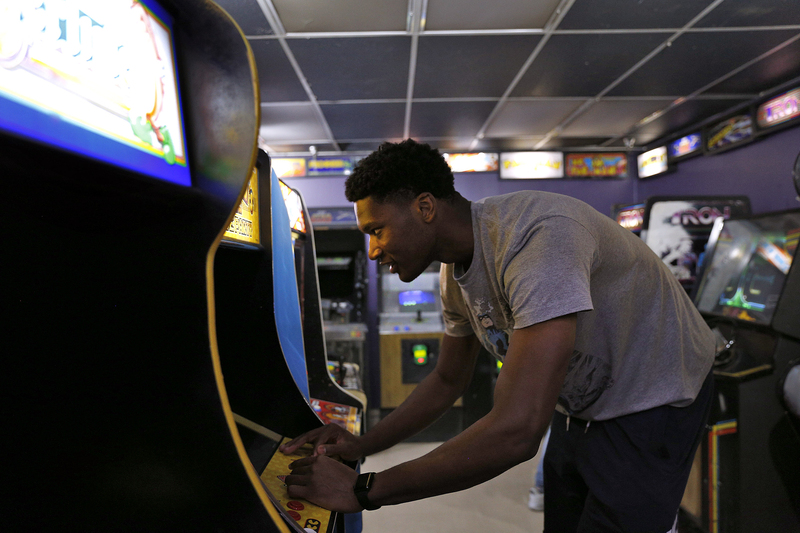 Damian Jones, 22, plays his favorite video game, Galaga, in between an interview. The two-time All-Southeastern Conference selection had the potential to become a top-20 selection in the 2016 NBA draft after departing from Vanderbilt after his junior season. Jones’ draft hopes dipped after he suffered a torn pectoral muscle in his right arm during a draft workout with the Orlando Magic that required surgery. The Warriors ended up drafting Jones with the last pick of the first round, 30th overall, in 2016. On Dec. 10, 2016, Jones made his NBA debut in the fourth quarter of the Warriors’ 110-89 loss to the host Memphis Grizzlies. He appeared in 10 regular-season games and four playoff games last season as the Warriors went on to win the 2017 NBA championship. Jones also played in 31 games last season for the Warriors’ Development League affiliate in Santa Cruz, averaging 11.3 points and 7.2 rebounds. Jones got his bling when the Warriors gave the players their 2017 NBA championship rings on Oct. 17, but he was not activated to play in the season opener against the Houston Rockets. Santa Cruz center Trevor Thompson was excited to see Jones get his ring after spending time playing with him in training camp with the G League team. Damian Jones with the Larry O’Brien Trophy. Golden State’s pecking order at center is starter Zaza Pachulia, David West, JaVale McGee, Kevon Looney and then Jones. So instead of watching in street clothes on the Warriors’ bench, Jones has been spending this season with Santa Cruz in the former D-League (rebranded G League from a Gatorade partnership) and has yet to play an NBA game this season. The Warriors exercised his contract for the 2017-18 season. “It made me feel good because it showed that they have confidence in me,” Jones said. Warriors head coach Steve Kerr and general manager Bob Myers get reports on how Jones is doing after every Santa Cruz game. Kerr said he also texts with Jones regularly and talks to Santa Cruz head coach Aaron Miles and Warriors two-way development coach Luke Loucks about Jones’ development. Kerr also believes it’s best for Jones to be in Santa Cruz right now. “It’s great for him. He needs to play. He wouldn’t be playing up here. Things are going well for him,” Kerr said. Jones admitted that he at times feels disconnected from Golden State because of his long absence. Even so, the Baton Rouge, Louisiana, native also understands why it is best for him to be getting reps in Santa Cruz. Jones said Warriors assistant coach Ron Adams recently told him to look at being in Santa Cruz not as a demotion but as a means to get playing time and get better. “You want to be up there with the big team, but you know you have to play in order to get better,” Jones said. “You can’t just sit on the sideline and watch. You have to get some game action. I always think of it that way. Also, I got friends on this team too. While I’m here, I might as well get better. Damian Jones (left) does shooting drills with coach Anthony Vereen during morning practice. The G League became the NBA’s official minor league system after it was established in 2001. The G League has 26 teams, which leaves all but four NBA teams without primary affiliates. Jones has an apartment in downtown Oakland, not far from the Warriors’ practice facility. 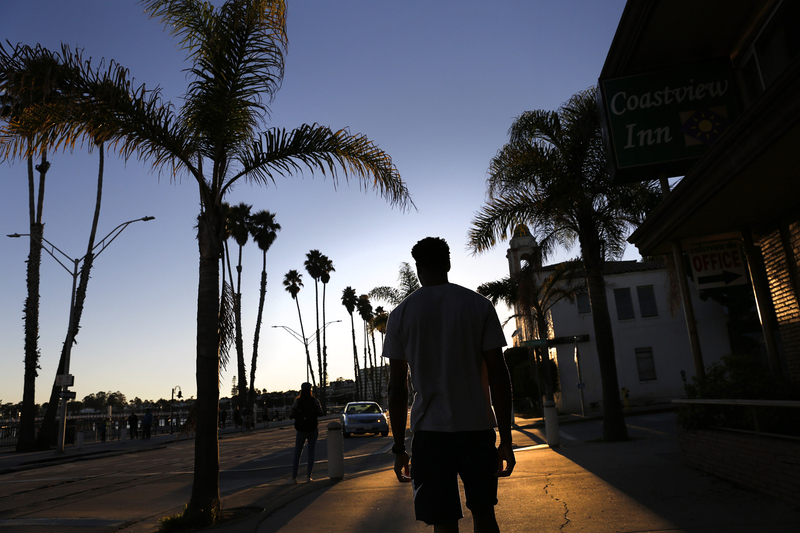 But while in the G League, he lives in a motel near the beach and across from the famed Santa Cruz Beach Boardwalk Amusement Park. Santa Cruz typically packs the 2,505-seat Kaiser Permanente Arena for G League games during the cold winter months when surfing and sunbathing are difficult. Considering that the G League also has teams in Fort Wayne, Indiana; Oshkosh, Wisconsin; Erie, Pennsylvania; and Sioux Falls, South Dakota, Jones could be in worse places than a town known for its amusement park, beach, skateboarding and surfing. Golden State Warriors and Santa Cruz Warriors G League player Damian Jones at the Santa Cruz Wharf. The Warriors typically stay in five-star luxury hotels and fly on private charter planes. G League teams typically stay at three-star hotels, which Jones described as “decent, like hotels from AAU.” Jones said he was in a hotel room in Rio Grande, Texas, and Sioux Falls last season where he had problems closing his room’s door. G League teams also fly on commercial planes. Santa Cruz often takes the 40-minute drive to San Jose International Airport. Since Jones is an NBA player, Santa Cruz must purchase the 7-footer either a first-class or business-class ticket for airline travel. G League teams occasionally go on long bus rides, like when Jones and Santa Cruz drove to Reno, Nevada, last season while it was snowing. Jones said he misses the direct charter flights with Golden State. But there is one benefit to traveling commercial. “I rack up my points. I got a Southwest Rapid Rewards account, so I get these points up,” Jones said. “I always try to sit in the front row. People usually don’t like to sit in the front row unless there is a lot of people preboarding. Flights usually aren’t really that long, so I’m straight. G League players not affiliated with NBA teams earn one of two salaries, $19,500 or $26,000, for the six-month season. Teams provide free housing for the players. Jones, however, is making $1.3 million this season whether he is called up by Golden State or playing in Santa Cruz. “It’s crazy about the [G League] salaries. It’s basically like a low-income job, especially being in this area, where the cost of living is much higher,” Jones said. NBA players receive a per diem of $129 for each day on the road in the 2017-18 season. Even with Santa Cruz, Jones receives the same per diem on game days. The G League per diem for players, however, is $50 per day. Jones acknowledged that he feels uncomfortable when he sees the per diem he receives compared with his teammates. So, has Jones faced any jealousy from his G League teammates or opponents? 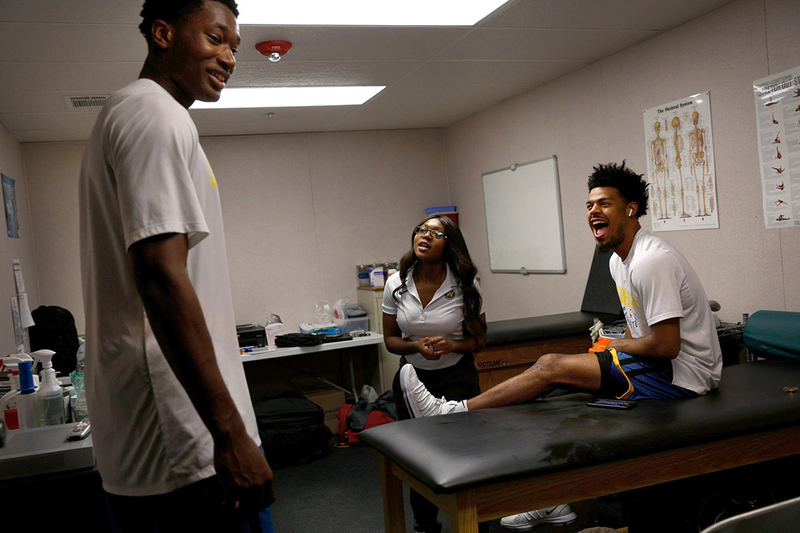 Damian Jones jokes around with teammate Quinn Cook and assistant trainer Jana Austin at Kaiser Permanente Arena before a game against the Long Island Nets. Cook was brought in as a two-way player for the Warriors. “Not really. No. Guys have been pretty cool. It’s been pretty chill. A lot of the guys have been on [NBA] teams before,” he said. Jones entered Thursday’s game against the Austin Spurs averaging 17.4 points, 8.3 rebounds and 2.1 blocks per game through 14 contests. It appears that Jones, however, could get more shots per game, as he is fourth on the team in attempts per contest with 10.3. While Jones may need to be more aggressive to get the ball, Santa Cruz head coach Miles yelled to his players to get Jones the ball more during the second half of a win over Long Island on Nov. 17. “Some teams, the tallest man is 6-9. It’s different from a size perspective sometimes. But everybody is hungry to play because they want to get that call-up,” Jones said of the G League competition. Miles faces the challenge of getting Jones the needed minutes, development and motivation while also trying to win games. The former Warriors and D-League guard said he often tells Jones to keep in mind that the Warriors have six players who can play center while other NBA teams do not. Miles said he has told Jones to “be great” so he will be ready when his time comes to be promoted. Santa Cruz entered Thursday’s game against Austin with a 9-5 record. 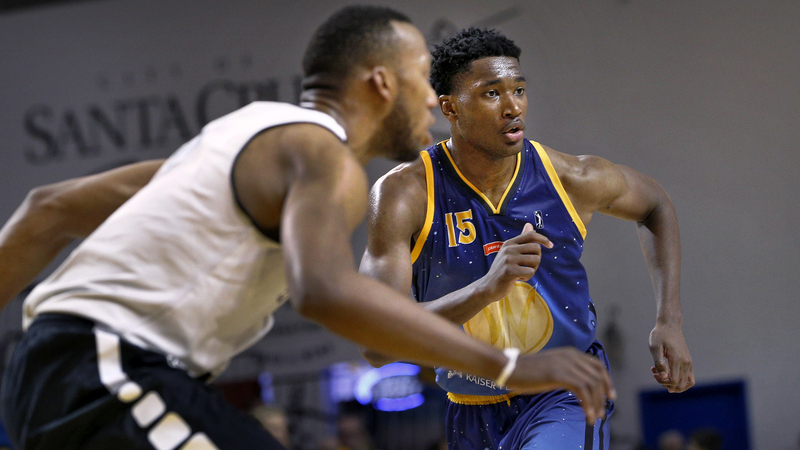 Damian Jones during a game against the Long Island Nets at Kaiser Permanente Arena. Jones is a Santa Cruz Warriors player in the NBA G League and was drafted by the Golden State Warriors. Golden State does not practice much during the regular season. It is not uncommon to see NBA players who do not receive much playing time go 3-on-3 against each other after practices or shootarounds. So along with a lack of playing time, Jones would also lack practice time to develop if he were with Golden State full time. Golden State, however, does have a two-way player development coach, Loucks, who works with Jones before and after practices. Loucks also attends Santa Cruz games, sitting on the bench, with Miles’ coaching staff offering reminders about Jones if needed. “Athletically, he is so gifted,” said Loucks, a former Florida State and D-League guard. “He has God-given athletic ability, and he can do things that clearly no one on the team with the Warriors can do. He’s 7 feet tall. He can jump 40 inches [vertical]. He can sprint like a guard. 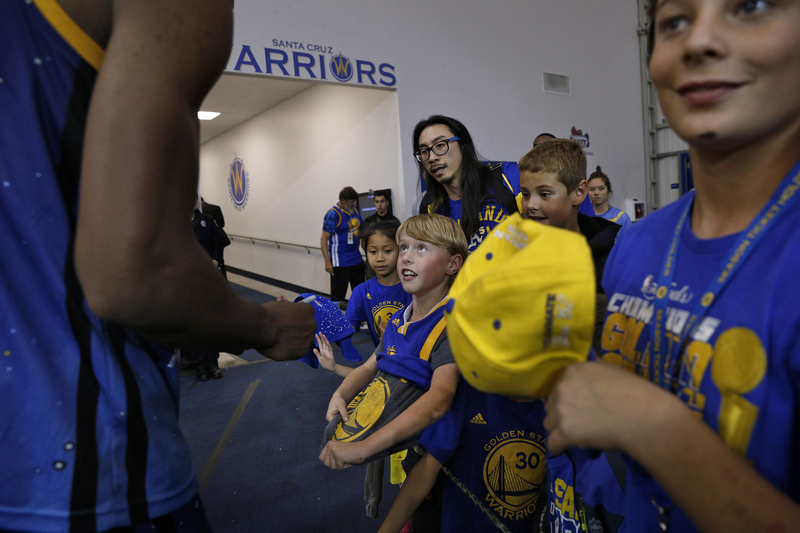 Damian Jones, 22, signs autographs for fans after the game. Jones says he enjoys walking around, dining at Beach Street Cafe and Hoffman’s Bakery Cafe, and hanging out in nearby Capitola often with teammate James Southerland. Jones goes to the movies with his teammates, including a recent showing of Justice League. He has joined teammates in laser tag in the arcade. He walks about 10 to 15 minutes to and from practices and games at the Kaiser Permanente Center from his motel. And when hanging out by himself, he works to keep his high score in Galaga, the arcade game his dad taught him how to play. 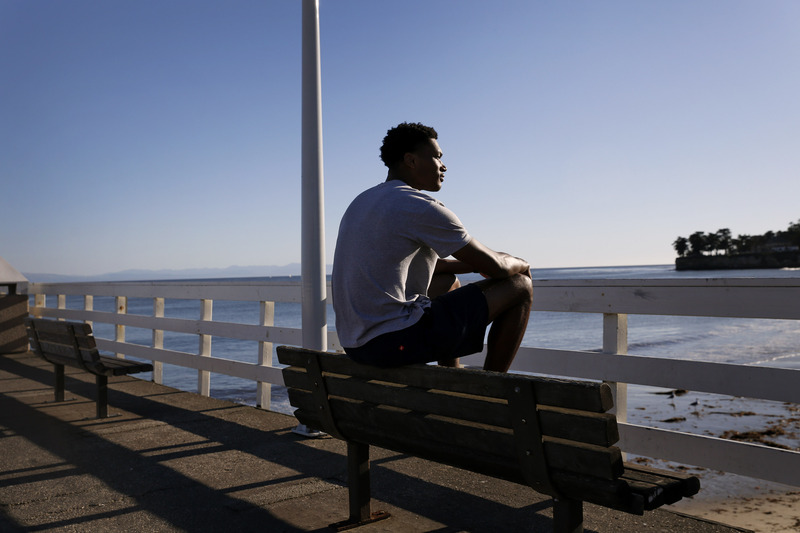 Damian Jones, 22, walks around Santa Cruz one late afternoon before a game. Jones doesn’t expect to get promoted anytime soon this season, but he also knows that that could change with an injury. The Warriors recalled two-way guard Cook from Santa Cruz after star guard Stephen Curry recently suffered an ankle injury that could keep him out two or more weeks. Meanwhile, Jones plans to work to improve daily while enjoying life off the court in Santa Cruz, knowing that any day his number could be called. “Anything can happen. I pray nothing happens [bad]. Things happen. You just got to be ready for the moment,” Jones said.